Stainless Steel, Disposable Microtome Blade Holders which fit most microtomes and cryostats. If you are looking for a system that combines the quality cutting characteristics of reusable blades with the convenience and consistency of disposable ones our blade holders are your answer. Versatile – The holders are designed to readily accommodate blades of differing thickness. Such adaptability allows the histologist maximum flexibility especially when difficult tissues are encountered. Durable – Because we use the highest quality stainless steel and the most advanced manufacturing processes, these blade holders are less susceptible to nicks and normal wear and tear. Convenient – Insert, clamp, adjust the angle, and cut. That's all it takes. Universal – For the first time, the quality and convenience of disposable blades are available for all rotary microtomes and cryostats – Even the popular Miles Tissue Tek(TM) (adapter required). Same as (#63050) except with an extended handle (E/H) to eliminate knife guard interference. 6⅜" (160 mm) long. 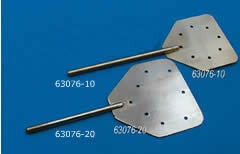 Same as (#63050) but designed for use with any low profile (L/P) microtome blades, #63063, #63065-LP, #63068-LP. Same as (#63050-LP) except with an extended handle (E/H) to eliminate knife guard interference. Patented SHUR/Sharp™ blade holder designed for interchangeable use of Low and High profile blades. Cryostat adapter (C/A) when using our blade holder (#63050) in the Miles TissueTek(TM) II Cryostat. Sakura Finetek – The Original One-touch and Heavy-duty holders. The one-touch holder offers easy and quick clamping of disposable blades. The heavy-duty holder has no internal parts to clean or maintain, making it virtually maintenance-free. These holders fit any rotary microtome, including Leica, Shandon, Leitz, Surgipath and Tissue-Tek. Each set includes a blade holder, one dispenser of Accu-Edge® Disposable Blades (63068-LP), maintenance tools, replacement parts and a storage case. Designed for use with Tissue-Tek II® Microtome/cryostat. Long lasting, easy-to-maintain. This stainless steel blade holder provides easy access to the blade and the tissue section. A anti-roll device keep sections from curling. Built-in magnets facilitate blade positioning. Designed for AO/Reichert cryostat microtome. It has a right mounted plate to accommodate its off-center blade position and anti-roll device and fits older AO/Reichert cryostat models. Designed to fit IEC, Bright, Leitz, Shandon-Lipshaw and other models. It features a centered blade fixing plate, an anti-roll device. 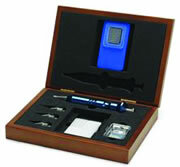 All the above Holders comes with a black resin coated faceplate which offers better visualization of specimens. Each set includes a blade holder, one disposable blade (#63068-LP), maintenance tools, replacement anti-roll plate and storage case. An Anti-Roll (A/R) Device which may be used with all our blade holders. It snaps on or off by a unique magnetic attachment system. Its clear plastic plate which is positioned above the sectioning blade prevents any sample curling. Made from hard plastic (Delrin) with a beautifully machined finish to handle many of your instruments that need to be at your fingertips during sectioning. 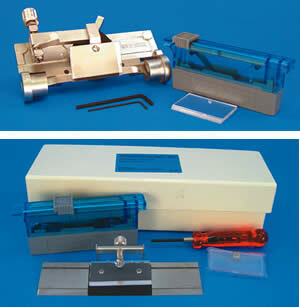 This EMS Ultra-microtome Aid is a safe place to rest your diamond knife, diamond trimming tool, tweezers, hair curl or eye lash, diamond knife cleaning rods, perfect-loop for picking up sections. Note: This unit is not a safe device to store your sectioning knives, such as diamond or glass knives, after you're done the sectioning. The Tissue-Tek Object Holder Mechanism is a unique device which conveniently fits into existing Miles Tissue Tek cryostats and permits X, Y and Z orientation of ball end chucks. It speeds up the process of cutting frozen sections. The Object Holder also enables the histologist to orient the specimen at any plane making sectioning of the correct portion of the specimen much easier. The holder comes complete with clamp and three ball end chucks. No longer is it necessary to throw away your valuable used microtome blades! This comfortable handle allows you to reuse your microtome blades for routine grossing. Its patented locking mechanism provides a safer blade replacement system than those products presently on the market. 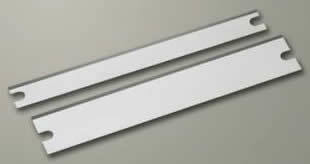 The handle is available in either an angled or straight configuration. Ultra-durable and long-lasting, these blades are ideal for both paraffin and frozen sections. These unique blades prove to offer higher quality sections with an elongated cutting life. 63058-01 35° 80 mm 8 mm 0.25 mm Universal blade. Perfectly balanced between sharpness and durability. Perfect for the sectioning of biopsies, ligament sections and soft tissue types. 63058-02 35° 80 mm 8 mm 0.25 mm Excellent durability for hard tissue types. 63058-03 30° 80 mm 8 mm 0.25 mm Blade for biopsy and extra fine sections. Very suitable for skin sections. 63058-04 22° 80 mm 8 mm 0.25 mm Ultrafine sections. Kidney and lymph nodes. 63058-05 35° 80 mm 8 mm 0.25 mm Universal blade for daily routine. Superior cutting performance and high durability. Also suitable for larger tissue samples. 63058-06 35° 80 mm 14 mm 0.32 mm Excellent for cryosectioning and ligament sections. The quality of sectioning depends on the quality of the blade being used. 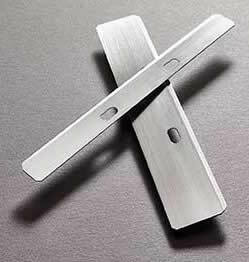 With sharp durable edges, our blades represent a new standard in sectioning quality. Standard Blade: For routine tissue samples, the standard blade offers an unsurpassed level of quality at an affordable price. Premium Blade: When more difficult specimens are encountered, simply switch to our premium type – a heavy duty blade which allows you to achieve ribbons of unsurpassed quality. The Edge: Years of research went into choosing the optimum stainless steel and edge combination. Repeated testing was performed by histologists to assure that SHUR/SHARP blades represent the ultimate in consistency for sectioning technology. Chatterless and compression free ribbons will become routine no matter what the tissue is. Made from high quality stainless steel. High and low profile disposable blades for use with all Leica microtomes as well as the Cryocut and Cryostat. A teflon-fluorocarbon resin-coated edge allows sections to slide off the edge without distortion. They minimize compression. Comes 50 blades in a dispenser box. Sakura Finetek – These ultra sharp, high quality microtome sectioning blades offer striation, distortion and chatter free sections. Comes in a dispenser with 50 blades. Low profile blades fit all Accu-EdgeÆ Blade Holders for microtomy and cryotomy #63048-10, #63048-20, #63046-02, #63046-10, #63046-20. The high profile blades are suitable for blade holders that are 14 mm in height. Packed 50 blades per dispenser. These unique blades feature innovative edge coatings that improves durability, lubricity and longevity. Made in the USA. Developed to meet the demands of the discerning user, the newest of this product line – the Infinity Microtome Blade – is highly precise and suitable for any application. Triple faceted to provide incredible longevity and performance, ideal for general paraffin and cryostat use. Coated with PTFE-like substance to allow a smooth cut. Designed for general, all-purpose cutting applications, including cryostats. Available in low profile only. Feature state-of-the-art grinding and coating techniques specially designed to create an edge that can produce superior sections with every cut. For general paraffin applications and cryostat use. Coated with a nitride and copolymer finish to provide smooth, wrinkle-free sections. They are durable, long-lasting and ideal for general paraffin and cryostat use. Uniquely coated to suit the widest variety of cutting conditions. A unique combination of durability and precision to save time and money. The ultimate blade for cutting all types of skin and hard tissue. A durable, tough, high-performance specialty blade. Amorphous diamond-coated cutting edge. The toughest, most durable blade in this line of products. Especially effective on hard tissue and decalcified bone. Uncoated, durable and economical. Available in heavy duty high profile only. A chemically pure, high-grade lubricant used in precision instruments. Should be used periodically to lubricate cross-roller bearings for microtomes. This optional workshelf with light is an added for user convenience when operating Tisue-Tek® Cryo 2000™ Microtome/Cryostat. 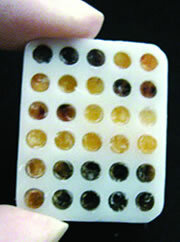 Tissue Microarray System: Building Superior Results. The Tissue Microarray are a collection of multiple tissue cores that are arranged in an XY fashion inside of a paraffin block allowing for histological analysis. The Tissue-Tek® Quick-Ray™ technique produces superior quality TMAs in less time than with traditional methods, and accomplishes finished products at a fraction of the cost. The Tissue-Tek® Quick-Ray™ uses a hollowed tip to remove tissue cores as small as 1 mm from paraffin-embedded tissue (donor block). The extracted tissue is then inserted into a preformed recipient block–the Quick-Ray™ System is the only system available that uses a preformed paraffin recipient block. The finished block is sectioned using a microtome; the sections are mounted on glass slides and then stained. Each TMA block can be cut into 300-400 sections at 4-5µ, which can then be subjected to independent tests. Common tests include immunohistochemistry and fluorescent in situ hybridization. 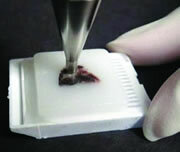 Compact design and versatility make building a Tissue-Tek® Quick-Ray™ TMA astoundingly simple. The construction of a TMA block can be done on any clean counter, and does not require a dedicated space. The Quick-Ray system is the only system available that uses a preformed paraffin receipent block. There is no other system or instrument that provides a ready to use paraffin recipient block. The finished block is then sectioned using a microtome; the sections are mounted on glass slides and then stained. Each TMA Block can be cut into 300-400 sections at 3-4 microns. Please see listing in Specimen Preparation Dishes for a complete description.